I remember our neighbors Down Neck as pleasant people. As the years rolled by our family made many friends. Some were extra special because they became "Compara" and "Commare", godfather and godmother. I don't know if there is a limit on the number of godparents, but we had our full share. My middle names, Ralph and Vincent, were given to me by two uncles. One was Si Raphael and the other Si Vincenzia. The Si is pronounced, Zee. It is a term of respect, like the word Sir, only more familiar and closer like an aunt or uncle. 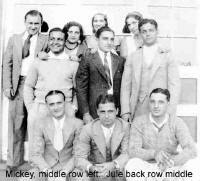 Our cousins were Uncle Elia's children, Jean and Mickey Liguori, Ray Fernicola, and Anne and Louie Liguori. Mickey lived nearby and we palled around together. We were only a year or two apart. Years later, Mickey married Mary Sherlock and had one daughter. Jean married Nick De Luca and had a son and a daughter. Uncle Elia's other children, Anne and Louie, married later in life. Uncle Louie married in his late forties and had no children. 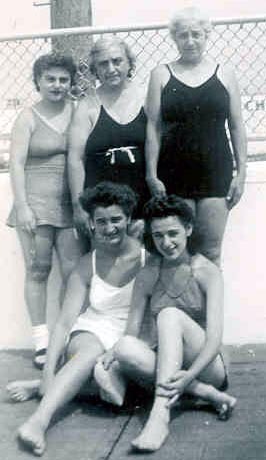 Our other cousins were Aunt Rose Divona's two children, Jitty and Frank. Jitty's husband was Frank DiMartino. They dropped by to visit us in St. Petersburg a few months ago. It was a surprise. They were in Florida and decided to look us up. They stayed for about two hours and left. 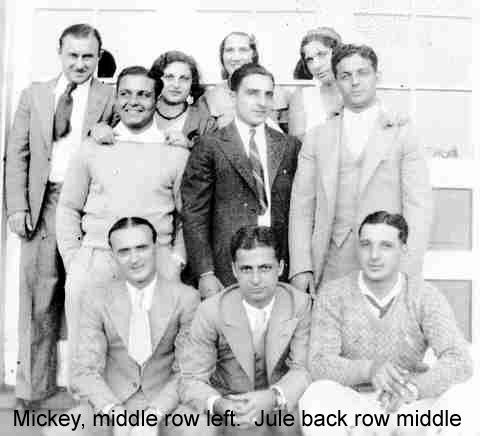 Aunt Concetta had six children: Josephine, Jeanette, Dolores, Vivian, Michael, and Junior. We never see any of them. "Aunt Connie," as she is called, is 91 years old. Her longevity is the result of the Liguori family stock. Aunt Rose and Aunt Anna are still alive today. Aunt Rose is 88, and Aunt Anna is 84. I'll always remember Aunt Anna because she was almost our age. She had four children: Vito, Tanya, Giovanni, and Mary. Uncle Phil is still living at age 93 and busy in his yard. Vito drives a truck for UPS. We never see any of them. Mom had a lot of cousins also, but I can't remember them all, and no one sees them. I don't think people socialize as much today as they did years ago. In the old days families used to get together. Today's generation is too interested in going out and raising hell.